James is the illegitimate son of James Howlett and Isabelle Lensherr (aka Magda the Witch) but shortly after birth he was given to, and legally adopted by James and Heather Hudson and lived the first 18 years of his life thinking he was their son. The Hudsons were old friends of Wolverine and kept Jimmy parentage secret at the mutant's request. Shortly after an almost fatal traffic accident from which he healed in minutes (much to the surprise of everyone but his adopted parents) James was visited by former X-Men Jean Grey and Kitty Pryde. They brought with them a message from his recently deceased real father, their teammate Wolverine. In the message Wolverine basically told Jimmy to live for the future and not to pry in his origins. Of course Jimmy didn't listen. You can't tell that to a reckless 18 year-old. So he joined the "Tomorrow People" which were pretty much a small group of former X-Men on the run, trying to protect other mutants. The name didn't stick for long, and the refugees ended up mostly living in a small reserve in the middle of nowhere, in a patch of contaminated land without water or food. Nevertheless, through the creative use of their mutant powers, they were able to turn the wasteland in a fertile garden they called Utopia, while fending off the attacks of mutant-hating groups, a government trying to enslave them, and even attacks by other mutant groups. Their plight only ended when Captain America was elected President of the United States. During the harsh years on the run, and living in Utopia, Jimmy become one of the mutant community leaders, eventually becoming Kitty Pryde's (who was elected Utopia's "president") right hand man. He had to learn patience, some diplomacy and how to fight against ridiculous odds twice a week. Once mutant rights were re-established by Steve Rogers, life became easy for a brief time. Although hardly normal. James even meet a group of six young X-Men from an alternate Earth, one of which was his father's teenage female clone. Just a little later, another Earth appeared in the sky and… that didn't end up well. Things got a little blurry. Jimmy vaguely remembers, dream-like, living in a city where most super-heroes had a double, Doctor Doom was God and demi-gods armed with magical hammers were his enforcers. Eventually, the super-heroes (and the Thors too) rebelled and went to fight Doom and his minions. There was a huge battle, and when it looked the good guys were winning, everything faded to white. And somehow, James got back to New York. But unfortunately, it is not the New York that he remembered. Even before getting his powers James was a rather reckless and brave kid. He was the first to try to climb up the tree, the first to leave the pack to explore, the one that would not be bullied by larger and older kids in school. He got into plenty of fights as he grew up, he broke several bones by being reckless. And he would have died doing illegal car races at 18 if his powers had not kicked in. It is even more extreme now that he knows he is virtually immortal. It is pretty hard to intimidate and easy to dare him into doing something stupid. He likes to show off, take risks and he loves to fight. One would expect the son of Wolverine would be aloof, grim, feral and a loner. Well, no. Hell, no. Jimmy does have a wild side, but he is a party animal, very comfortable in a crowd and quite the flirt. Sure, sometimes it is nice to run through a forest and breathe clean air for a few hours, but for him humans are far more interesting than wolves. Although generally easy going, when set into a goal James is very focused and stubborn. He may lack some discipline, but not determination. When he commits to something he will pursue to worlds end and let nothing or no one stand in his way. He is a bad enemy to have, since he can hold grudges forever, but he is a good ally and friend, his loyalty is iron-clad. James has few ambitions for himself. Instead, he tends to find worthy causes (and leaders) and stick to them. Like the errant knights of old, he seeks wrongs, corrects them, and moves on. He is not a man of peace, so when peace is achieved, he becomes restless and seeks something else to fight for. James wouldn't voice so, but his goal has been always to fight for a good cause. He loves conflict, but he prefers to serve a just cause. So gravitates towards people with compelling causes. Maybe someday he will be the one with the vision, but for now he is young and he has much to learn. At a personal level, he wanted to know more about his real parents, Wolverine and Magda (and the Mothervine project) but that seems quite irrelevant now he is trapped in a different world. 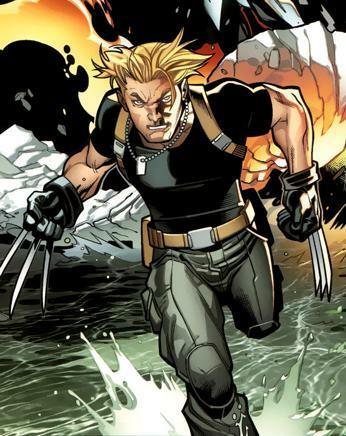 James inherited his biological father 'healing factor' and so he is able to recover from injuries at an amazing speed. Bruises vanish in seconds, skin and flesh heals almost as fast, most bones realign and mend in less than a minute while entire organs like missing eyes or even the heart will regrow in a few minutes. A severed limb (even the head!) can be reattached if done quickly, or otherwise it will regrow, although the process takes several hours. Because of his regeneration abilities, James is almost invulnerable to poisons and diseases. Extremely high doses of poison or drugs might slow him down or even knock him out a few minutes the first time they are used. Afterwards he develops almost total immunity. It is very hard for him to get drunk. For the same reason James ages very slowly and probably will live to be 300 or 400 years old if he manages to survive his violent lifestyle. All of James five senses are enhanced to superhuman levels. He has hawk-like eyesight and can see perfectly well in very low-light conditions. Even in complete darkness, as his eyesight extends into the near infrared, although he can't differentiate colors if there is no light at all. His hearing rivals with a wolf's, and if he focuses he can hear a calm human heartbeat ten yards away. His sense of scent is also exceptional, he can generally recognize people by their smell, and he can even track them down. Although he lacks Daredevil's training to use his senses at the fullest, he could learn to do so. Probably due to his healing factor and senses, James muscles are far more efficient than a normal human. He has exceptional reflexes, strength and stamina. He can lift about a thousand pounds, he can run at over 30 mph, jump further and higher than an Olympic athlete and he can keep going for days. His body never tires, but his mind does, so he still needs sleep a few hours every day to be at his best. James has three foot long claws in each hand, razor sharp and with a pointy tip. The claws retract into his forearms when he wants so, and appear between his knuckles (creating a small wound that closes almost instantly). The first time the claws sprouted they were made of bone, but within seconds they transformed into some kind of organic metal. James has found them to be unbreakable and able to cut anything he has found (so far, he has never tried to cut ultra-hard metals like vibranium or adamantium, and when he does, he will find his claws have limits). James is an excellent hand to hand fighter, combining peak human strength, agility and speed with the sharp senses and instincts of a predator. He received some training in formal martial arts during his years in the X-Men, but mostly he honed his skills through constant fighting. There are few unenhanced humans that could stand him for long, even if he is not using his claws, although he still has quite a bit to learn before being his father's equal. He is also familiar enough with the use of modern military firearms, but not with ancient weapons like swords or bows. James was in put in charge of Utopia's security, as he was the militia's leader, a position that forced him to study and learn about military small unit tactics. That the X-men succeeded in defending the mutant enclave even against the US Army is a good indicator that he took his job very seriously and he has a knack for strategic planning. It doesn't mean he liked it, and he is more comfortable relying only in himself and not giving orders or putting others in the line of fire. But if someone needs to be put in charge, he is your guy. Given his physical abilities it is no surprise James is an exceptional natural athlete and acrobat. But he has also trained intensively to get the most out of his abilities, often sparring with mutants that physically were vastly superior to himself, such as Colossus. James is pretty good following trails and tracking people. His senses help immensely, but he has also trained himself to be able to hide, move silently and stalk animal and human prey. He is better in the wilds or at least sparsely inhabited areas, because in an urban environment his senses tend to be overwhelmed. When he was younger James wanted to become a racing car driver. He was great behind the wheel, and he knew his way in and out a car or motorcycle engine. Nowadays, it is a hobby he rarely can indulge much. But he is still remarkably good driving most kinds of commercial land vehicles. A native from Earth-1610 (the Ultimate Universe) James has no legal identity in Earth-616. This means he is an illegal emigrant without no country to return to. He can't open a bank account, he can't get a work contract and he can't even get a driving license. Then again, he was not much better in his homeworld, being a mutant and all. So he can cope, more or less. He earns a living pit fighting and picking odd jobs, and he drives an old Harley that he won in a bet. Violence chases James like a bloodhound, except when it is the other way around. Fact is, he likes to fight, and he is very good at it. So he gravitates towards trouble almost automatically, and he rarely fails to get into violent situations every week. Usually he can handle it. Sometimes he ends up badly beaten up. But that doesn't stops him for long. Having sharp senses has a drawback. Jimmy can be stunned by loud noises, blinded by bright lights or just driven into confusion by a mixture of sensorial input that a normal human can handle without much trouble. On the other hand, he recovers faster than a normal human, even if his eardrums burst, they will heal in about thirty seconds.